Supporters of Turkish President Tayyip Erdogan wave Turkish flags during a pro-government demonstration on Tuesday at Taksim square in central Istanbul, Turkey. 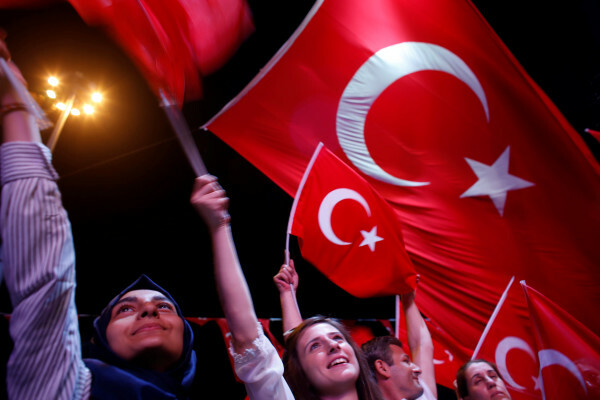 ISTANBUL — Turkey vowed to root out allies of the U.S.-based cleric it blames for an abortive coup last week, widening a purge of the army, police and judiciary on Tuesday to universities and schools, the intelligence agency and religious authorities. A spokesman for President Tayyip Erdogan said the government was preparing a formal request to the United States for the extradition of Gulen, who Turkey says orchestrated the failed military takeover on Friday in which at least 232 people were killed. In parallel talks, U.S. Defense Secretary Ash Carter and his Turkish counterpart discussed the importance of Turkey’s Incirlik Air Base in the campaign against Islamic State in Syria and Iraq, the Pentagon said. The base, which is used by Turkish and U.S. forces in the air campaign against Islamic State, has been without power in the days since the failed coup. Gulen, 75, who lives in self-imposed exile in Pennsylvania but has a network of supporters within Turkey, has condemned the abortive coup and denied any role in it. A former ally turned critic of Erdogan, he suggested the president staged it as an excuse for a crackdown after a steady accumulation of control during 14 years in power. On Tuesday, authorities shut down media outlets deemed to be supportive of the cleric and said 15,000 people had been suspended from the education ministry along with 100 intelligence officials. A further 492 people were removed from duty at the Religious Affairs Directorate, 257 at the prime minister’s office and 300 at the energy ministry. The lira weakened to beyond 3 to the dollar after state broadcaster TRT said all university deans had been ordered to resign, recalling the sorts of broad purges seen in the wake of successful military coups of the past. Prime Minister Yildirim accused Washington, which has said it will consider Gulen’s extradition only if clear evidence is provided, of double standards in its fight against terrorism. “I urge the U.S. government to reject any effort to abuse the extradition process to carry out political vendettas,” Gulen said on Tuesday in a statement issued by the Alliance for Shared Values, a group associated with the cleric. Turkey’s Deputy Prime Minister Numan Kurtulmus told reporters that 9,322 people were under legal proceedings in relation to the attempted coup. Yildirim said Turkey would respect the rule of law and not be driven by revenge in prosecuting suspected coup plotters. Speaking alongside the leader of the main secularist opposition Republican People’s Party, he said the country must avoid the risk that some people try to exploit the current situation. The Nationalist Movement Party, a right-wing group and the smallest of the three opposition parties represented in parliament, said it would back the government if it decides to restore the death penalty. More than 6,000 soldiers and about 1,500 others have been detained since the coup attempt. About 8,000 police officers, including in the capital Ankara and the biggest city Istanbul, have been removed on suspicion of links to the plot. Some 1,500 finance ministry officials have also been removed from their posts. Annual leave has been suspended for more than 3 million civil servants, while close to 3,000 judges and prosecutors have also been purged. A court remanded 26 generals and admirals in custody on Monday, Turkish media said. The coup crumbled after Erdogan, on vacation with his family at the coastal resort of Marmaris, phoned in to a television news program and called for his followers to take to the streets. He was able to fly into Istanbul early Saturday, after the rebel pilots had his plane in their sights but did not shoot it down.